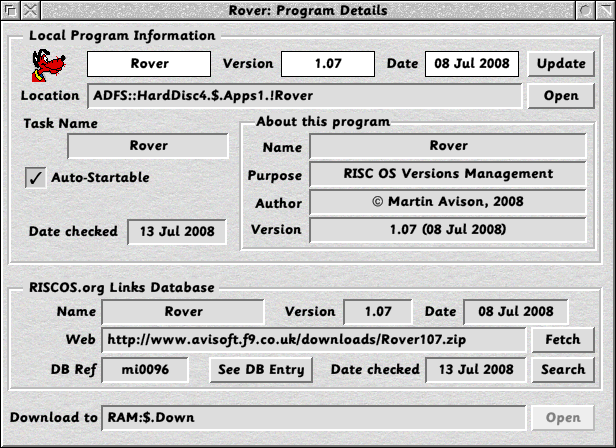 The !Rover application will help you to keep track of RISC OS versions of programs, i.e. which programs are installed on your computer. the latest available versions of those programs. Rover is intended to be used for Application programs, but may also be used for Modules and Absolute programs. It is NOT intended for the myriad of components of RISC OS. The RISC OS Links Database, maintained by Paul Vigay, aims to hold details of all RISC OS programs. This database was initially designed to enable users to find programs using a web browser, showing information about the latest versions and where to get them. However, with a lot of programs installed this can be a rather time-consuming process. 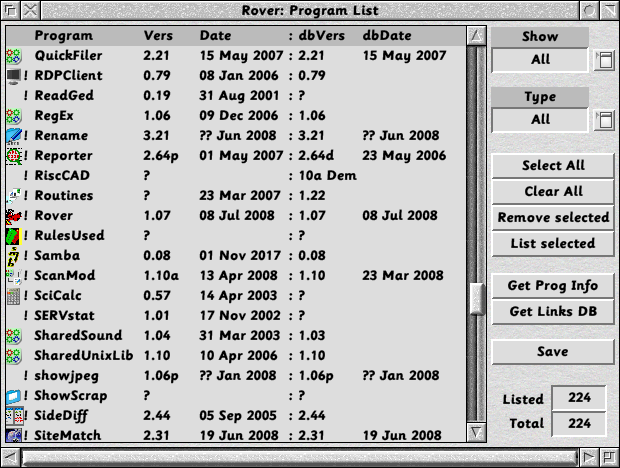 Programs can be registered to Rover, and it can then use an interface to the RISC OS Links Database which allows remote applications to run searches. Rover can then easily show which programs have been updated, and help you to download them. Note that Rover does not do anything without being asked. It simply tries to collect information, which after validating may be useful in helping you to keep your software up to date. v1.00 07 Jan 2008. Initial general release version. v1.01 08 Jan 2008. Cleared Info and download fields on delete. Added download field to sort. v1.02 08 Jan 2008. Fixed GetProgInfo for Toolbox programs. v1.03 16 Jan 2008. Various changes and improvements. v1.04 22 Jan 2008. More changes and improvements. v1.05 23 Jan 2008. Fix for startup failure if no programs registered before. v1.06 17 Mar 2008. Added vertical scrollbar to Details if max height too big for mode. Enabled Wget to run in a TaskWindow properly. Fixed startup Sprites problem with Iyonix if 1024MB memory. v1.07 08 Jul 2008. Fixed problem if Module help has blank in name. Catered for LinksDb returning Version Date value. Changed LinksDb communications so more immune to Db changes. Catered for versions 'n_nn' and 'vn.nn'.